November is an odd month for herbs if you live in a temperate climate. There are a few still hanging on in the garden; maybe a tough sage or some rosemary that’s well rooted in, but many of the deciduous plants have already dropped their leaves, so we home herbalist have to rely on either dried product, or those herbs that we can grow from seed on a bright windowsill. Coriander is one such herb. It grows quite easily as long as it is kept moist and warm, and with a bit of tender care can bring a vibrant verdancy to the cold season. Coriander is also called cilantro, Chinese parsley and Mexican parsley, although Mexican parsley may also refer to verdolagas which is a completely different plant. If you shop in Asian superstores, you may find it referred to as dhania. In cooking we tend to use either the seed or the leaves. The seeds are like little, round, crunchy balls, that give off an amazing citrusy aroma when toasted or dry fried. These can then be ground to make a spice mix or paste, or left whole to add texture as well as flavour. The leaves are still citrusy but earthier and warmer, and in my opinion you can rarely use too much! They are best really, really fresh and even the stems are tasty as long as they aren’t woody. Asian cuisines such as Indian and Pakistani make good use of coriander, as does the very different Mexican cuisine. This is an herb that does equally as well in eye wateringly hot dishes, as it does in mild, refreshing dishes, such as raita or guacamole. You can also add it raw to salads, which I like to do with a little splash of soy sauce. Experiment! Apparently the root can also be used, and is prevalent in Thai cookery. The root of coriander is harder to come by in shops though, so you may need to grow your own. Once the warmer weather returns, plant some coriander outside in a sunny spot. The flowers will attract hoverflies, one of the best organic pest controls there is. The leaves of coriander are absolutely stuffed with good news vitamins. Vitamin A, or retinol, boosts the immune system, helps maintain good vision and is very good for the skin. Vitamin C, ascorbic acid, keeps our cells healthy and helps the body heal itself. Vitamin K helps with blood clotting and healthy bones. Coriander is full of these vitamins, as well as calcium and potassium. 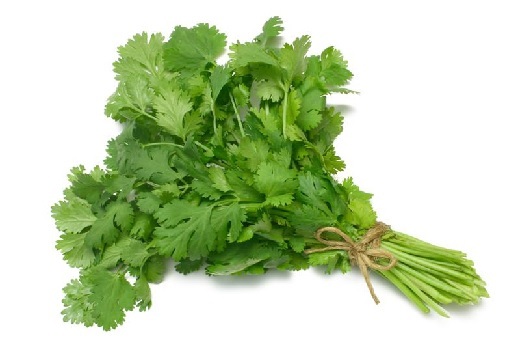 Coriander was used as a medicine, as far back as ancient Egypt. Seeds have been found in Egyptian tombs, and it is thought that they were used as an aphrodisiac. In modern aromatherapy, coriander fragrance oil is used to ease the mind and fight fatigue. It has a calmative effect on the digestive tract, and is supposed to help detoxify the body. It can also be used as an ingredient in massage oil to help relieve stiffness of the joints and improve circulation; an application recommended by Hippocrates, the ancient Greek father of medicine. This can be applied in cases of rheumatism and arthritis. Always consult a doctor first! Coriander, like many of our herbs with ‘volatile oils’, has anti-fungal properties. A very recent (2014) study found that the herb was potentially very effective against oral thrush, and the same study strongly encouraged further research into other health benefits of coriander. The dislike of the taste of coriander is a hereditary trait! It’s important to understand that we believe, due to archaeological evidence, that coriander has been widely used for over 3000 years. This herb has a majestic history, and deserves respect. In Ancient Egypt coriander symbolised eternal love and enduring passion; the unity of body and soul. This is most likely why it was used as a burial herb for loved ones. The Book of Exodus speaks of manna, a substance like coriander seed but much tastier. This sustains the people of Israel as they search for a new land. Coriander can have a slightly narcotic effect, but you would have to eat a huge amount before experiencing this! However, a couple of seeds in some incense, with the right intent, could aid a meditation for visions, or aid a sleep for dreams. Continuing the Egyptian theme of passion, coriander has been used in love potions throughout the centuries. Now personally, I don’t approve of love spells, but if that’s your thing, coriander is certainly a potent ingredient. Coriander is also associated with longevity and immortality, healing and overall good health, and the element of fire. It may be associated with Mars but occasionally it is also linked to the moon. Make a cloth sachet and fill it with cotton wool and a few coriander seeds. As you sew the sachet together, think of your most wanted goal; something you wish to draw near to you. Visualise your goal complete, as you place the seeds in the sachet and seal it. Keep the sachet on your person for a whole cycle of the moon. If you move closer to your goal in this time, keep the sachet in a safe place. If not, bury it with thanks and try again, or meditate upon your goal first. Cook a meal for loved ones with coriander as a garnish, as a symbol of how much they mean to you, and how unbreakable your bond is. Make a pentagram of coriander stems and hang it on your door to attract positive energy into your home. …until very recently that Salsa Verde (the Mexican type, heavy with coriander) is absolutely beautiful after a shot of tequila! The herby sauce completely removes the sting of the alcohol.